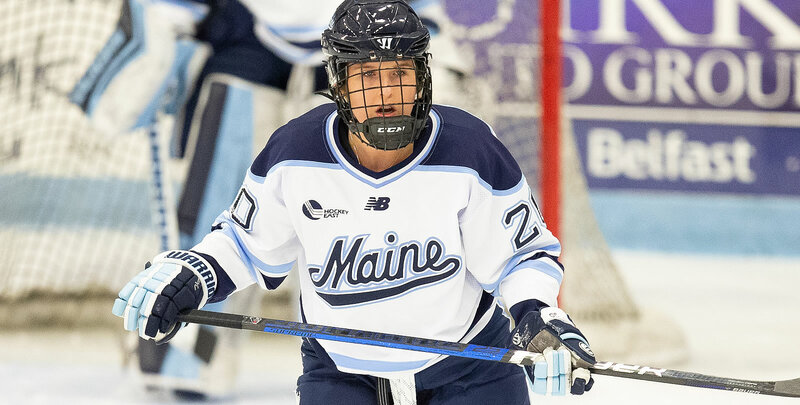 ORONO, Maine - The University of Maine women's ice hockey team defeated the Dartmouth College Big Green, 4-1 in an out of conference matchup Saturday afternoon at the Alfond Arena. First goal (1-0 Dartmouth): Tess Bracken wasted little time on the power play scoring Big Green's first goal of the contest. Maine was called for hooking, which gave Dartmouth a two minute 5-on-4 advantage. Bracken only needed 00:12, as she found the back of the net. Chloe Puddifant and Lotti Odnoga both assisted on the play. Second goal (1-1) : Celine Tedenby tied the game with a wrist shot from the fair side face-off circle. Tereza Vanisova collected the puck and saved it from leaving the attacking zone. The forward found Tedenby patiently waiting for the puck. The Ornskoldsvik, Sweden native did the rest and tied the game at a goal apiece. Third goal (2-1 Maine): Tereza Vanisova scored a breakaway goal only four minutes into the second period that gave her squad a 2-1 lead. Ida Press was, for all intents and purposes, trying to clear the zone, but, instead, her pass found Vanisova waiting and ready to score. The forward skating with a full head of steam towards to Dartmouth net. Maine held a 2-1 advantage 4:19 into the second period. Fourth goal (3-1 Maine): Tedenby scored her second of the game with 7:44 left in the second period. The freshman's shot found its way between the Dartmouth's goaltender's legs. Vendula Pribylova and Tereza Vanisova were credited with the assists on Maine's third goal of the afternoon. Fifth goal (4-1 Maine): Brittany Kucera scored her first goal of the year with 12:04 left in the game. Michelle Weis found the unmarked defense at the top of the attacking zone. Kucera wired a shot through Dartmouth's netminder. The goal would be the last of the contest, as Maine would hold onto the 4-1 lead for eighth win of the season. - Carly Jackson finished the game with 12 saves. - Brittany Kucera scored her first goal of the season in the third period. - The Black Bears went 0-2 on the power play, while Dartmouth went 1-4. - Maine ended the game with four total blocked shorts. The two teams will do battle again tomorrow, Sunday, November 25th. Puck drop is schedule for 2:00 pm in the Alfond Arena.